Review: Great Trail. I can't believe I rode this trail in November. Beautiful weather, amazing views. 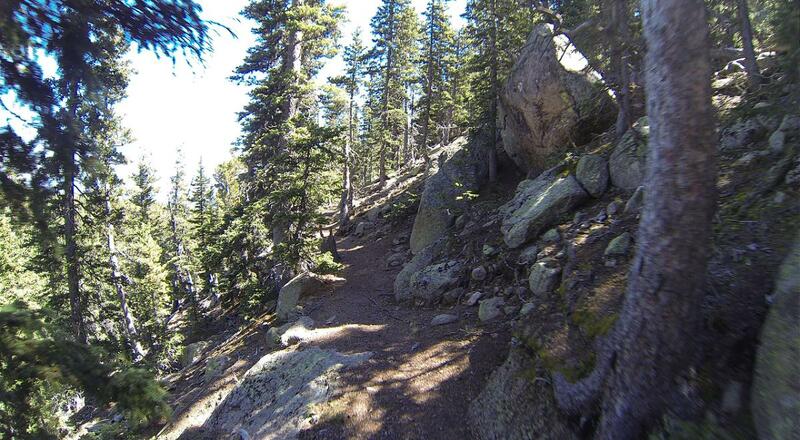 Starts at almost 12,000ft elevation and links up to Barr Trail around 10,200. We shuttled to the trail head on Pikes peak highway. The route we took which included Barr Trail, Manitou Resevoir Trail, and Heizer trail was a complete blast with over 5,000ft of descent. Great Technical, very rocky. This is definitely a trail where you need to be on your game in the technical sections. Completely do-able on a hardtail but I was very glad I rode my FS bike. Review: Outstanding trail! Drop dead scenery. Fast and furious. Technical in places. Great mix of open areas and tight area. Some dry and some lush, some gravelly and some perfect soft pine needle trail, but all spectacular, and in what an environment! Well worth the toll on the Pikes Peak Highway and the effort to shuttle. Review: Hello John. I agree with you, this is an awesome ride and worth the bucks. Review: Hit this trail Yesterday (7/5/15) for the very first time. The trail is in fantastic shape. I took my hard tail fat bike and really had a blast. The views are amazing. This isn't my normal type of trail, it's basically a 14 mile downhill blast starting above treeline is quite the experience and once you drop a thousand feet of elevation or so you are right in the deep forest tracing a flowing line of singletrack. We stopped quite a bit to let our disk brakes cool. They got too hot to touch even with gloves on more than a few times. Due to all the rain this spring the trail was grippy and dust free until the last couple of miles. There were also a few bridges and a water crossing to make thinks interesting. Like I said, it was a little too much of s downhill ride for me, but if that's your thing, or your looking for some adventure this is a must do trail. Did I mention the views!!! Review: I was up on PP today Sat 05/18, and the trail was still just a little too snowed in to ride. Review: Elk Park is a great ride. If you're going to ride Pikes Peak, I prefer to start at the summit and do Barr Trail. I think it flows better. But if you've already done Barr Trail from the top, hit this one up. It is a little technical in spots until you merge at Barr Camp, a great place to grab a snack. It's no easy cruiser though in the top half. Review: My son, a friend and I rode Elk Park yesterday morning as a DH shuttle, connecting with the Barr trail to finish down in Manitou. Wow, what a ride. Dropping over 5000' in just less than 12 mi, it throws pretty much everything a DH trail can throw at you except a major jump. The trail is currently in great shape. The surface is just awesome. There is none of the deep scree that is typical of much of the PP region. It is fast, fun with many techy spots and gnar thrown in to keep you very honest. The trail runs from PP Hwy and traverses PP for about 6 mi mostly through a beautiful mixed conifer forest of spruce, limber pine, bristlecone pine and aspen until it junctions with the Barr trail. Then it's just under 6 mi again down the Barr until you reach the bottom. Both trails are awesome and fast. Lots of little jumps. Lots of drops and obstacles made from rocks, roots and logs. The lower Barr has several switchbacks with multiple drops in many of them. Directions: To get there, pay your $12 per person fee (ouch) at the bottom of PP Hwy. Then head up the beautiful, paved hwy until just before MM 14 (also 0.6 mi from the hairpin turn above Glen Cove). There you will see a small sign on your right, which says, "Timberline". At this sign but on the left side of the road, you will see a metal gate sort of hanging there cockeyed. There is no sign for the trail here, but turn left at the gate anyway, and drop onto a small dirt road. The trail begins on the first turn of this dirt road. Once again, there is no TH sign here either, but be assured this is Elk Park trail. And be assured, this trail will not disappoint you. It is one awesome ride. Review: Rode this trail today. A little snow left at the top. This trail is great ride a lot of nice tech rock sections and even more stuff to catch some nice air off of. Cant wait to ride it again! Review: The first 5 miles of this trail is arguably the best in the local area. It doesn't disappoint after the first 5 miles, but hikers become a serious issue. There are tons of hikers and trail runners on Barr trail. Overall, however, even with the lower crowd, this is still my favorite trail in the local area. This trail has epic views, smooth single track, dirt that propels your ride, technical challenges that make you smile while gritting your teeth, a wood bridge crossing, and a creek crossing. This is simply a spectacular experience! Here's a tip, if you shuttle up (Recommended) save your receipt and you can use it again to go pick up your vehicle at the top, as long as it's the same day. Elk Park Trail MTB Trail 4.92 out of 5 based on 11 ratings. 11 user reviews.